German Zulassung Certificates for stainless reinforcing steel. 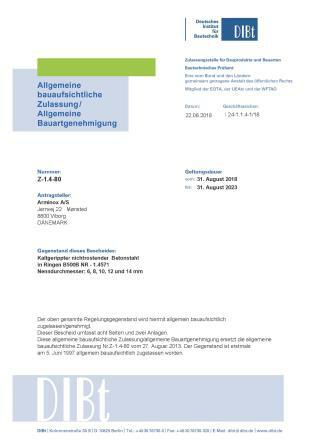 Arminox has renewed our German Zulassung Z-1.4-80 for EN 1.4571 (316ti) stainless reinforcing steel. The Z-1.4-80 Zulassung is issued by DiBt (Deutsches Institut für Bautechnik) and is audited by MPA Braunschweig (Materialprüfanstalt Braunschweig). Read more about our product certifications here or download the new certificates in our download area.